Wireframe page templates and the DemoSite prototype model are often the focus of UxP work. They embody the “vision” of the design effort. They are the reference point for stakeholder sign-off. They are the basis for project documentation. They provide guidance for code development teams. The wireframe pages presented here were created as an actively “clickable” live HTML model that demonstrates both the organization of information and the experience of interaction. I find it useful to “cut out the middleman” and go directly to a clickable wireframe demosite . Or at least design one-off’s with that as the goal. Stakeholders always want to see The Real Thing as soon as possible. We lay the groundwork for how to view the templates with an explanation of our Design Conventions. They represent some of issues that are of greatest interest to stakeholders. Go to the DemoSite document for how the DemoSite works. Go to the SiteMap document for navigation & organization. These wireframes are not intended to indicate colors, styles, text content or even layout – The presentational attributes will be handled by the Creative Team. The wireframe “styles” are intended only to indicate what we think the information content entities are, about how much screenspace they get, and how prominent they are. We use levels of lightness and darkness to indicate prominence (where we’d like your eye to go). The wireframe images are only approximate and indicative. They are not meant to imply a ready-for-production design stylesheet. Focal areas are brightest against a general light grey background. Featured info elements have an outline (they are probably more prominent). Links are indicated in blue. We look to the project stakeholders and champions to give us a sense of What Works, What’s Wrong and What’s Missing. We’d also like guidance on rankings of Importance. 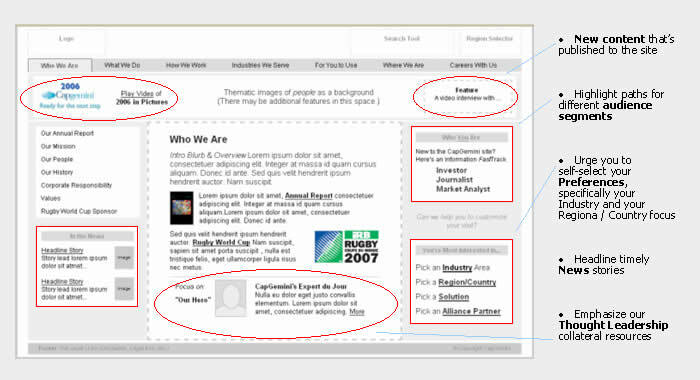 A basic visual attribute of the Demosite page wireframe is Layout. This is the reality check that allows us to see “at a glance” that important information buckets are available – and which ones are most prominent. The wireframe shows how we organize and present information. The wireframe exposes & explains what you can do. An underlying theme of usability is Affordance: “The ability to do something”. The image shows how a graphically enhanced mouseover News Story popup is a great way to provide a visual “hook” to that collateral resource. Note: You probably got to this reference window page by clicking on a “document” icon in the MainWindow. The image captures the functionality of the MegaMenu feature. Basically, this is a “souped-up” dropdown menu with its own unique branding identity: When you mouseOver one of the menu tabs along the top, the hover panel presents visual “sizzle”, as well as direct links to featured information. Because the wireframe in a DemoSite provides only shallow interactivity, we often need to describe how important UI features and functionality operate in the supporting document. The wireframe demonstrates UI functionality. I’ve always liked Dreamweaver as a fully-featured platform that can go in both directions. Your choice of tool depends on your deliverable. And that depends on client expectations. “Native Design” (using html & css) is a bigger design investment, but has longer legs. I believe that “capturing functionality” in annotations (if not in the model itself) is tremendously valuable when working – and communicating effectively – with both implementation teams and business stakeholders. A shorthand solution is to point to a Use Case or Best Practices doc via a referential popup.